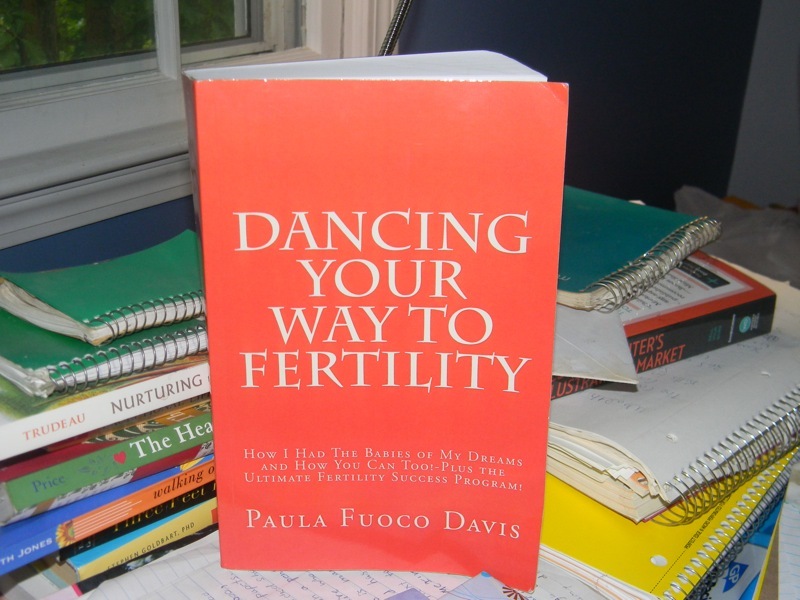 Dancing Your Way To Fertility – Had enough of hearing ‘no you are not pregnant?’ The information you need to beat infertility…a hand to hold on your hardest of days. I have one more IUI before my surgery in July. How great it would be if I got pregnant this time and never had to go through the surgery at all. Today I taught a magazine writing class at the community college I attended in the early 1980s. Since I am a reporter, teaching writing is something I do occasionally. Typically, I love teaching. I teach one-day classes on Saturdays. Sometimes I teach journalism, sometimes writing your family history, sometimes magazine writing. Usually, teaching these classes leaves me with a buzz, a thrill, a high almost. When I teach, I am seventeen and in love, I am six and allowed to go on the merry-go-round one more time, I am 11 years old and sitting in my treehouse, I am 14 and someone (anyone) thinks I am pretty. When I teach, the insecure, negative, self-hating part of me disappears and I emerge strong, confident, and full of possibilities. The girl in college who wore a white cotton dress and truly believed that anything and everything was possible returns briefly for an encore. When I teach, I realize that my true calling was not working as a newspaper reporter, but being in a classroom with students. But today, my teaching experience was completely different than usual and left me feeling pretty hysterical. Here’s why. The class started out as usual. to talk one-on-one about why they took the class and what they hope to learn from the class. The students come to my desk one at a time and share their goals for the class. Now it is the turn of the woman sitting in the front row who looks to be in her mid-30s. Immediately, I like her. She seems spunky. Wham–I am in for quite a ride. For the next seven hours, eight counting lunch, all I hear about is her horrible experience with infertility and how it DIDN’T work out. Her voice and desire to share her story was louder and more fervent than any other person in class. She had enough anger and fury to dominate the entire class discussion. Even during lunch, when I hoped for a break from hearing about her pain, which scarily mirrored my own, she sat with me outside on the picnic bench and continued her story. I felt for this woman. At another time, the teacher part of me might have been glad she took my class in order to share her pain. But the infertility patient part of me wanted to tell her to shut up. I struggled all day to remain professional, calm and not interject with my own experiences with infertility….but inside I was screaming was IS THIS GOING TO BE IN SEVEN YEARS? Am I going to turn into her eventually? Will I try and try like she did and never get a baby? Was her lot my lot? No, no, no, I kept saying to myself. I won’t make the same mistakes she made. I was going to a highly reputable clinic. I was already working on improving my overall health. But still….I felt panicked and scared. Hearing her story just confirmed all my worst fears: that I could do infertility treatments year after year after year with no result. All she ever wanted was a baby. All I ever wanted was a baby. Were we two peas in the same hopeless pod? I hid my feelings all day, knowing it would open a can of worms if I told her I too was in the midst of fertility treatments. But now back at home, I am burning with pain. Will this be me in seven years? She reminded me yet again of the terrible statistic that not everyone who goes to a fertility clinic ends up with a baby. I can’t stand to hear these statistics. They make me crazy. because if I don’t get pregnant in one year, I will adopt. I will always and forever keep trying for my own biological baby, but I will adopt before I let seven years pass without a child in my life. Hell, if I end up with both an adopted baby and a biological baby, what an incredible blessing that would be. Throughout the class, her pain was raw and rageful in a way I clearly understood, but surely didn’t want to see, hear or understand. Why did she have to take my class? Was I suppose to hear something she said? Was I suppose to know that sometimes this doesn’t work out? God help this woman, God help me. Let us both get the babies we so desperately want. They have ordered some new tests. This morning I was scheduled for a test I am dreading. I am so afraid of this particular test. I don’t think I have it in me to do this test. The whole drive down to the clinic, anxiety rattled around my body. How in the world am I going to make myself go through this test? Then I got an idea: on the way to the clinic, I went to a drive-through Dunkin Donuts and ordered two of my favorite chocolate frosted donuts. I get to the clinic, sit in the waiting room holding my donut bag, and soon am called in for the test. The nurse leaves the room while I change. When she comes back in, I am lying on the table, dressed in a johnny, with the donut bag sitting on my stomach. “What are the donuts for?” she asks, straining to act like no-big-deal-so-what-if-a-bag-of-donuts-is-sitting-on-a-patient, but since she’s not a professional actress, her irritation comes shining through. “They are my reward for going through this test,” I said. My logic here is this: if I can lay here, endure whatever I have to endure, all the while seeing and smelling these two donuts that I am going to eat the moment the test is done, the test won’t feel so bad or be so hard to take. Nothing is a better reward for me than chocolate donuts. The doctor comes in, and very politely asks if I want to eat the donuts sitting on my stomach before they do the test. Again, he is trying to be nice, but obviously is a bit confused by the presence of the donut bag on my stomach. The great efforts everyone went through to show respect to me, even though I obviously looked eccentric, was both hilarious and touching. What a nice group of people at this clinic. “No,” I giggled. “I’ll eat them later,” and it felt good to laugh and see the humor in this whole situation. They did the test, and all the time I kept focusing on was: if I can get through this test, I can eat my donuts. I tried to think of nothing else, not the pain, not the nurses, not anything but the reward coming: the donuts. How I love chocolate donuts. The test ended. Everyone left the room. Before I even changed out of the johnny, I devoured the donuts in about ten seconds. Ah, the power of chocolate donuts. Even the most unpleasant test was bearable because I had two grand and delicious donuts to look forward to. Maybe I’ll try this again. The surgery is scheduled for July 6. Almost two months away. I wish it could have been sooner, but at least I feel like progress is being made. Maybe I do have endometriosis and they never caught it. Maybe it is the reason I am not pregnant yet. As I write that, some anger comes up…Do I have to direct their every step? It is aggravating to think that if I hadn’t spoke up, Dr. P might have kept me on Clomid indefinitely, all the time knowing that if it hasn’t worked by yet, it probably was never going to work. I feel a bit ashamed too, that my behavior made them think I couldn’t handle shots. I can handle shots…Hell, I can handle anything if it gets me a baby…why would they assume that just because I am verbal about my fear it means I can’t handle it? If I silently suffer, does that mean I am handling the stress better than someone who is verbal about their fear? That is the odd thing about the culture we live in—people that hide their pain are presumed to be a lot stronger than those who verbalize it, but in some cases, the person who holds it in might be a lot more stressed than someone like me who gets it out and then is over it. It is hard to explain that to someone who doesn’t cope in the same way, however, so I won’t even try. I met with Dr. P today and found out a few disturbing things. One is that yes, he knew I should be moving on to a stronger medicine, but because I tend to get scared and stressed during the procedures, he didn’t think I could handle moving on to shots. I want to scream at him! Instead, I force myself to stay calm and I explain to him that the more time that passes, the less nervous I am during procedures. He seems skeptical, but I continue talking calmly, stating that while I may seem nervous, that is just my style of coping—and that the moment I leave the clinic, I feel completely calm and back to normal (which is true. I expulse everything and then I’m over it. It could be called being Italian, but I don’t say that because it may sound weird.) He agrees to do the lapascropy and will schedule it soon. After that is done, depending on the outcome of the surgery, we will move on to shots. I am now waiting for a surgery date. It is June. One year and three months since I began infertility treatments. Such a long time and still no baby. I am sad. No, I am beyond sad–I am enraged, frustrated, full of yearning. I am tired of yearning. I long to hold hands with a baby…a baby that is mine. I look at mothers in supermarkets, mothers who look angry, tired and annoyed at their rambunctious little brats and I think: God, why can’t that be me? Why can’t I be pushing around a cart full of loud, overtired, rambunctious children? These mothers look so overworked, and yet they have no idea that I would do anything to have what they have. These women look deceivingly ordinary in so many ways, and I think: why can’t I have their ordinary life–the one that includes a grocery cart full of babies? There is a woman I see occasionally who has four young children. She is beautiful and her children are lovely too. When I saw her holding hands with one of her young sons the other day, I was struck with that image–the image of a woman holding hands with her son. Hands to hold. I want little hands to hold. feel like to hold the little hands of a baby that you gave birth to? What I would give to hold such little hands, to know those hands were mine to hold, to know that those were the hands of my daughter or my son? I am going to write Dr. P a letter to ask that he do a lapascropy to see if I have a problem with endometriosis. I hope he listens and does what I want. I have to word the letter in a way that will get him to do as I ask. I need little hands to hold. Hands that are all mine. To all the women I see shopping in supermarkets, who see themselves as ordinary mothers, I say–you have everything I want and there is nothing ordinary about your role as the mother to those little humans who are driving you crazy. Please God, give me a little human to tire me out. Please let me be an ordinary mother in a supermarket one day. I can’t imagine anything in this world more special or more fun than pushing around my babies at the supermarket. My happy-ever-after is so plain and ordinary, boring even, and yet it feels so hopelessly impossible and faraway. I know that something is wrong with me that the clinic is not catching. Month after month, it is the same thing. I do an IUI cycle and the answer turns out to be no. No, no, no. No pregnancy. No, no, no. Why is nothing working? I decided today I’m going to write a letter to Dr. P requesting they do a lapascropy to check for endometriosis. Maybe I have that, and they are not catching it. I’ll type the letter, let them know I have some of the symptoms of endometriosis, and force them to look. They are wasting time and I don’t have time to waste. I’m taking this into my own hands. I also want a different medication. If Clomid should have worked by now, I need to move on to something stronger. The other day, Christine, the ultrasound technician, cued me into something I should have known: she told me that Clomid usually works in the first three cycles, and if it doesn’t work by then, usually another medication is needed. And hello doctor: why didn’t you bother to mention that to me? This made me realize how little I know about these medications, and how if you leave your treatment in the hands of busy doctors, you might never know when precious time is being wasted. It also made me realize how helpful it is to know a person like Christine who lets you in on the little ‘secrets’ of the infertility quest. I’m pissed of right now. Why didn’t they tell me this? Why are they wasting my time? I need to write my doctor a letter and request that we move on to the next level of medication. I also need to educate myself about the medications I am on. Sitting back and trusting the medical professionals isn’t a great idea when everyone is so overworked and busy.